Another Great Seafair, Another Great Year! With Seafair 2015 now officially behind us, Fox Plumbing & Heating wanted to take a moment to thank those who attended, worked and raced at Seafair this past year. Fox had a wonderful year, and we look forward to seeing all of you in 2016. Congratulations to Tim Seebold for Winning the Graham Trucking, Inc. Seafair Cup! Tim Seebold and his team from NGK took home the Graham Trucking, Inc. Seafair Cup. This win only adds to overwhelming evidence that Tim Seebold is probably the best Formula One Powerboat driver in the history of the sport. As the most winning driver in US history, Tim has over 33 victories. Tim's boat takes 180 degree corners at over 100 mph, pulling g-forces of 6.5. To put that into perspective, a top drag race car only does about 5.4 g's. And these boats can turn, which makes them the hardest turning race vehicle in the world. 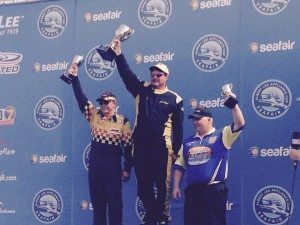 And we couldn't be more proud of Tim and his team's win at Seafair. Congratulations to Greg Hopp and the GP-12 Hydroplane Race Team for Winning The Grand Prix West (GPW)! Greg Hopp and his team won the Grand Prix West title this year, and Fox is proud to be a part of that win. In 1994 Greg began driving Unlimited Lights. He has worked his way up through the ranks to drive the Unlimited class in 1998, and becoming the Rookie of the Year in 1999 of the Grand Prix West Club. In 2000, Greg replaced the retiring Chip Hanauer in Fred Leland's U-100 where he has garnered numerous Heat and race wins, World Records and National Championships. His 2015 Seafair win is just a note in his extremely impressive list of accomplishments in this sport. Fox Plumbing & Heating at Seafair is always a Win for Us! The team here at Fox Plumbing & Heating looks forward to Seafair every year. As a local premium service provider to King County and Seattle, Seafair runs in our veins. "When I was a child, I'd ride my bicycle down to Genesee park and camp out on Friday night. I'd wake up early on Saturday and claim my spot to watch those Hydroplanes cut across the water." - David Brown, President and Owner of Fox Plumbing & Heating. Fox also had the opportunity to present Cal Phips with the H1 Unlimted Hydroplane Heat 2B Trophy. Being able to stand among some of the best drivers in this sport, it's truly a sense of accomplishment. Being a local company having the opportunity to support our community, and be recognized along side such other giants as Starbucks, Oberto, Tommy Bahama, Oracle, Wells Fargo, 76 Fuel and Breitling is truly a great feeling. And standing with other local companies such as; Franz, the Seattle Seahawks, Graham Trucking, Safeway, Accutint and Ezell's shows why Seafair will always be associated with Summer here in the Puget Sound.